A new prolific genotype of sheep (GMM x P) with traits of high prolificacy, more body weight and more milk per dam is being developed in Animal Genetics and Breeding Division of ICAR-CSWRI, Avikanagar through three breed crossing system with genetic constitution of 12.5% Garole, 37.5% Malpura and 50% Patanwadi in which Fec B gene has been introgressed successfully. 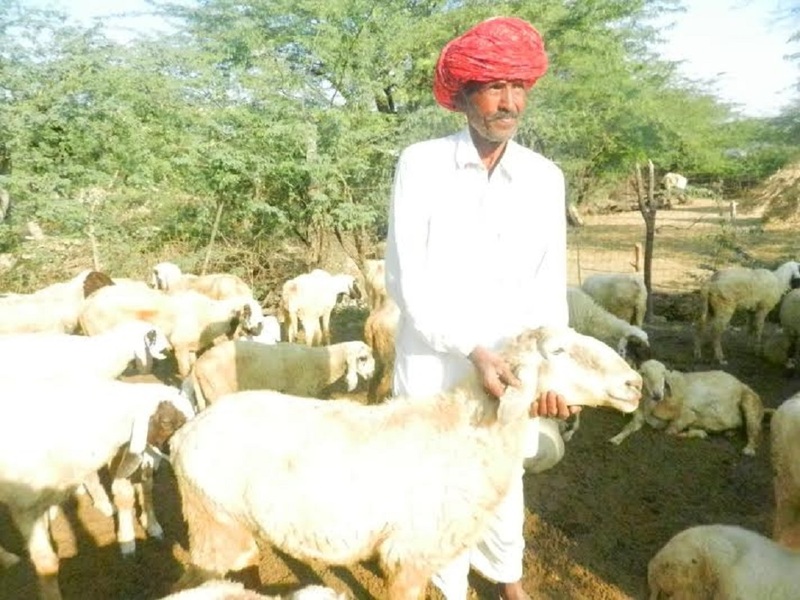 Towards evaluation and testing at sheep owner’s door, a unit consisting of five adult ewes and one breeding ram of GMM x P genotype was provided to Mr. Gopal Jat sheep farmer of Rindliya village in Tonk district during September 2013. So far 22 lambs were born out from 14 lambings obtained from five ewes of CSWRI. The twin lambings were six and triplet was one with litter size of 1.57. Therefore, by rearing such 100 breedable ewes, a sheep keeper would be able to harvest 40 extra lambs in a year compared to non-prolific ewes with 85% lambing percentage and 95% lamb survivability. Hence, the farmer will fetch extra income of Rs. one lakh in a year by selling of 3-4 months old lambs of such crosses @ Rs. 2500/- per lamb. The average live weight at birth, three and six month of lambs produced at the said farmer’s flock was 3.01, 13.73 and 22.95 kg, respectively. The ewe productivity efficiency (EPE) of prolific crosses in the field conditions was 18.73 kg and 29.06 kg at 3 and 6 month of age, respectively which excelled the local Malpura sheep. In fact EPE, i.e. total lamb weight harvested by the ewe at a particular age of lamb, is an extremely important economic parameter of mutton production which is highly influenced by ewe prolificacy as well as survivability and performance of lambs in prevailing management conditions. The pre-weaning survivability of lambs born from prolific ewes was around 95% that indicates the adaptability of new germplasm in the field conditions. Thus improved breeding technology (prolific sheep) may prove as a boon in times to come towards enhancing the economic returns per sheep for livelihood security of Indian sheep keepers.